When I am not out leading WPA Photo Workshops and Tours I am kept busy with some unusual assignments. One of my clients is a busy Photographic Studio in West London where we typically shoot promotional product imagery. 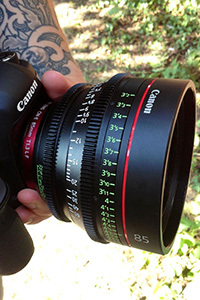 Last week Canon UK delivered to us three prime CN-E Cine lenses for us to shoot, CN-E 24/1.5, 50/1.3 & 85/1.3. They come in two mounts; EF or the Cine dedicated PL mount, the ones we received were with the EF bayonet, so of course we slipped them straight onto a Canon 5D DSLR & took some stills – amazing! They’ve been designed for unsurpassed HD 4k image quality, all wrapped up in a robust workhorse construction with fluorite aspherical elements, with 11 bladed aperture irises for creamy bokeh. They’re manual focus with a 300° degree movement (manual focus stills lenses have typically closer to 180 degree of max to min focus adjustment) for extreme accuracy. First impressions of any of these lenses were their physical size, everything about them was seemingly straight out of a cartoon, completely ‘over the top’ what with their massive barrel & oversized markings, not to mention their weight, albeit a complete work of art, beautifully made, and at 1.3kg, quite a lump. But check out the results, pin sharp, superb contrast with creamy blur…. Would I have one? Well, at about £4000 a pop, so approximately three times plus the price of Canon’s Pro L series primes, which offer auto focus – no would be the answer for stills photography, but it was great fun having a chance to play around with these babies! !